I haven't played in the Mixability Challenge in a while! Today, the challenge is to use a certain brown tone that has been proclaimed the ugliest color in the world! Well, I used it a teeny bit on the stem of this gorgeous Bearded Iris from an ODBD set called A True Friend. The rest is colored more in sepia brown tones. After coloring with copics, I painted it with Wink of Stella. Then I added texture with modeling paste. And I also used a toothbrush to spatter black ink. Good morning! God Bless You! 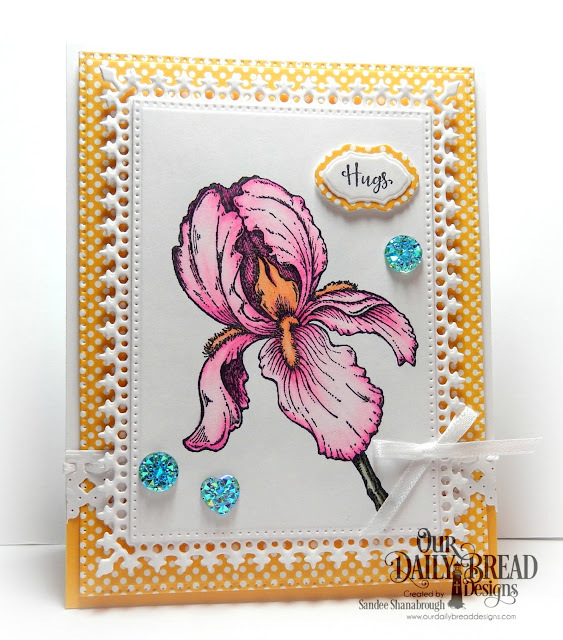 I made this card this morning following the Sketch Challenge #602 at Splitcoast! I used a new set from Our Daily Bread Designs called Sweet as Perfume. I have to be honest, I had never heard of a flower called Frangipani! But then I found out it is just another name for Plumeria, which I have heard of. It is such a pretty flower! I stamped the image twice, cutting out just the flowers on one stamped image. I colored with copics to match the ODBD designer paper. The Pierced Squares are new this month also. 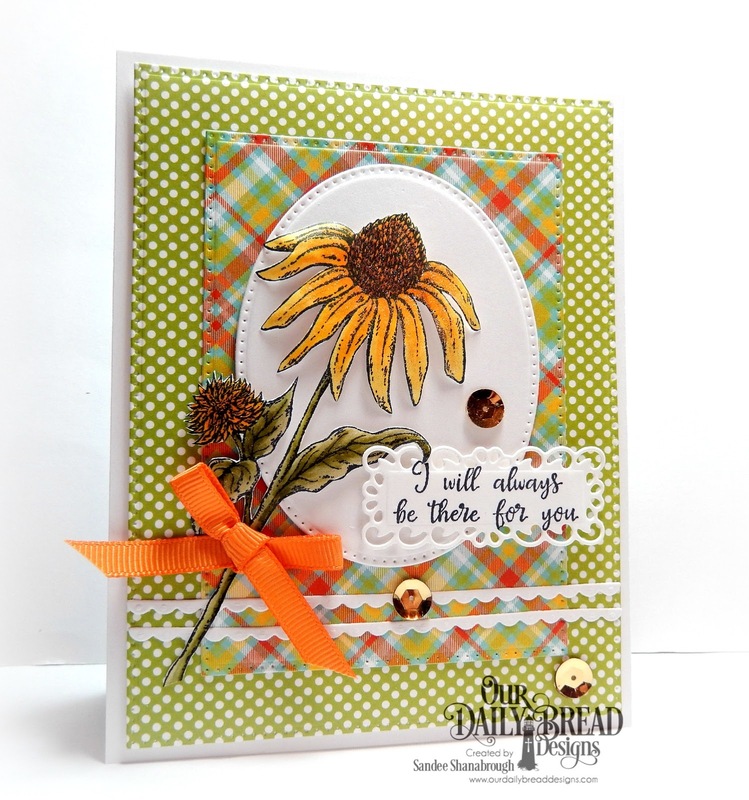 I added orange ribbon and a Bitty Border to complete the card. Oh yeah, I painted the image with Wink of Stella but couldn't get it to show well in the photo. I Love today's TLC at Splitcoast! How fun to create stamp selfies! LOL! One thing I learned this morning is that I really need to invest in masking paper. I ran out of post it notes so I had to sort of wing it and you can see some little booboos but that's ok! I'll definitely be trying this again! 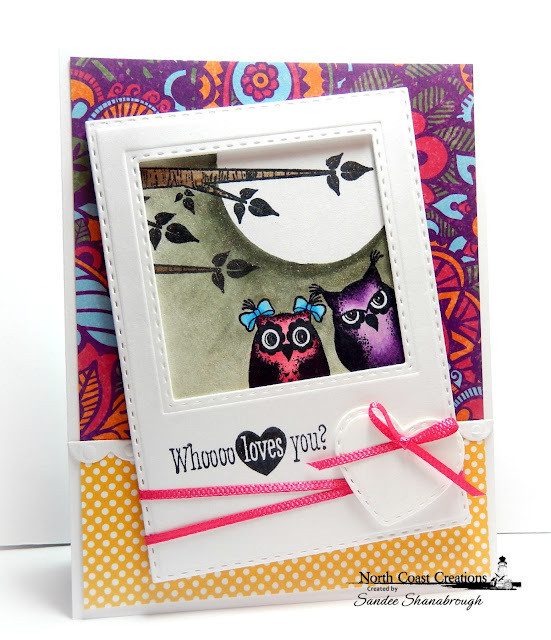 My owl couple are from a North Coast Creations set called Who Loves You? I used an ODBD Circle die to make a mask for the moon. After stamping the tree limbs and owls, I put the circle mask down and did my best to color the dark sky with copics. The frame was cut with ODBD Double Stitched Rectangles and Double Stitched Squares. The designer papers are ODBD Beautiful Boho and Birthday Brights. I also used ODBD Bitty Borders and Mini Stitched Hearts. It is hard to see in the photo but I colored the sky and the eyes of the owls with Wink of Stella. Well, thanks so much for stopping by! I have another card to share that I made for my hubby! He is celebrating a birthday today! 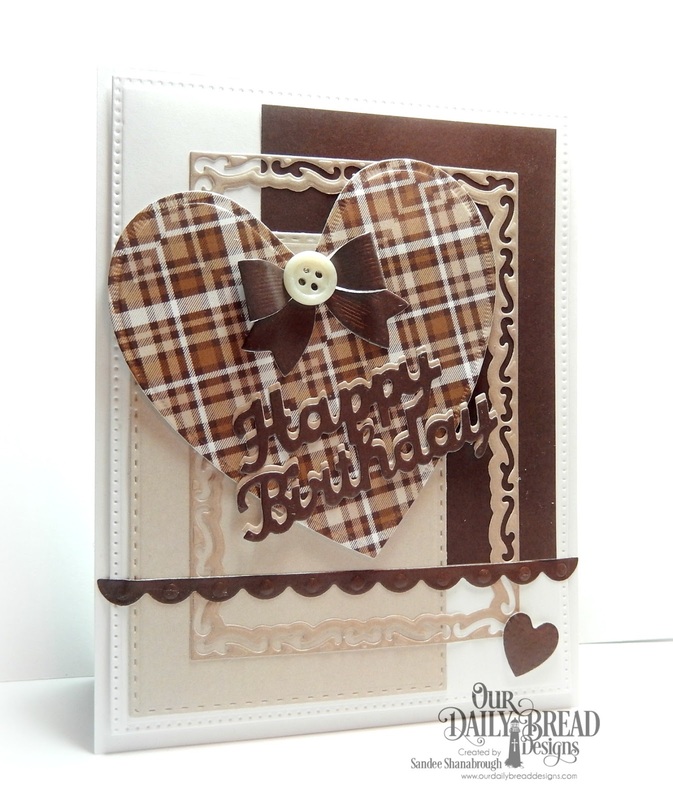 are from Our Daily Bread designs! Looking Back at the ODBD July Release! Today we are looking back at the July Releases from ODBD! These images are gorgeous and so fun to color! My card today features the new set called Forever Friends! The cone flower was colored and fussy cut. I layered it over a Pierced Ovals and then two panels of Birthday Brights Paper cut with Pierced Rectangles. I added a couple of Bitty Borders. The sentiment is cut with the smallest die from the Filigree Frames dies. I added the little bow and a few sequins to complete the card! For more inspiration with the July products, go visit my DT sisters! 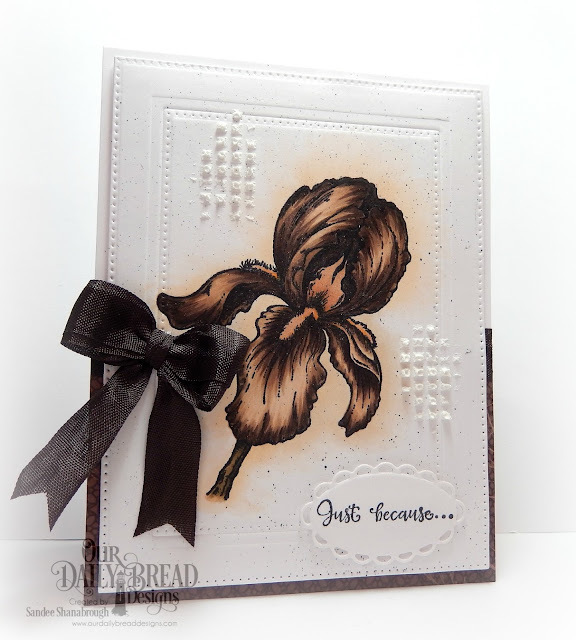 I really am loving this bearded iris in the new ODBD set called A True Friend! I colored the iris with copics and cut it out with a Pierced Rectangle. This panel is layered with a Lavish Layer die cut and then popped up over another Pierced Rectangle cut from Birthday Brights Paper Pad. The sentiment was masked from a longer sentiment stamp in the set and cut out with the tiniest Vintage Border die and then layered with one of the Mini Tags and Labels dies. I added a few sparkly pretties and then painted the petals with clear Wink of Stella.